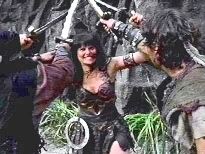 Editor's Note: CHANGING TIMES, a regular feature of WHOOSH!, examines episodes of the internationally syndicated television show, and considers the changes happening individually and between the two characters, Xena and Gabrielle, along with discussing the clues offered in each episode about their pasts. The episodes will be reviewed in the order they were originally aired. The reviewer will approach her material as if she did not have knowledge of the upcoming episodes. Insights to subsequent episodes will not be made in the earlier episode but in the latter ones. The series, XENA: WARRIOR PRINCESS, will be treated as a story where gaps must have explanation and what is there may be given more meaning than originally intended. to appear at the same time. In WARRIOR...PRINCESS (#15) we get to see Xena over-estimate her 'many skills' and learn more about Gabrielle's patience and understanding. Xena negotiates with King Lias. WARRIOR....PRINCESS (#15) starts out with King Lias asking Xena to help him protect his daughter, Princess Diana, and to also help him put an end to slavery in a neighboring kingdom. We learn several interesting things about Xena in this single conversation. We already knew that Xena did not take gold for her services [THE PATH NOT TAKEN (#05); CRADLE OF HOPE (#04)], and here again she refuses to take any money even from someone who can easily afford it. In fact, she states that she is not a mercenary and that she does not fight for money. Perhaps she is giving part of the reason that she does so: because she used to do things for money and she is consciously detaching herself from her old life. Not only that, she may want to keep her reputation as a fighter for good and those who need her legitimate. Another interesting thing to notice is that Xena gets slightly ticked at Tesa calling her armor a 'costume' and then trying to cover it up with a scarf. Xena has never much cared what people thought of her armor before, but then again, no one has been stupid enough to comment on it before. To Tesa's credit, Tesa did think that she was talking to Princess Diana, and not Xena, a dangerous warrior princess. However, does this portend that Xena is beginning to care what people think about her? Xena handles the fact that she has a look-alike with little problem, but Xena over-estimates her skills for once. Xena takes the place of Princess Diana with very little information to go on, confident that she can easily bluff her way through two days of being royalty. She makes mistake after small mistake until everyone is wondering about her. Through her quick-thinking, Xena manages to pull things off so no one can question her openly, though. Xena manages to make up for the lack of 'impersonating princesses' skill by quickly learning how to act so that in her final deception, everyone, including the audience, actually believes she is Diana. Still, the fact Xena could not curtsy well, did not know what side of the dress was correct, and did not know much etiquette, shows that she really has not been much in the company of the upper-class in her past. At the very end, Gabrielle asks Xena about what it was like being a princess. Xena actually makes a joke. When Gabrielle mentions servants, Xena tells Gabrielle, "That's what you're here for." Xena has finally become relaxed enough around Gabrielle that she is making jokes with her now. Gabrielle has time on her hands as she waits. The fact that Xena leaves Gabrielle behind on her own shows that Xena is gaining trust in Gabrielle's ability to defend herself. That Xena sends Princess Diana out to be protected by Gabrielle seems to show that Xena thinks Gabrielle is not only able to defend herself, but someone else as well. When we first see Gabrielle, though, she is being accosted by a man wanting her money. Gabrielle sees Diana (thinking her Xena) and waits for Xena to save the day. When it is clear she is not going to, then Gabrielle whips out her staff and beats the bad guy away. This seems to show that Gabrielle is used to letting Xena protect her and maybe even underestimates her ability because she is so used to having Xena around. 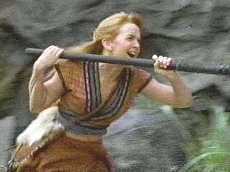 Also, we learn that Xena has been continuing to teach Gabrielle how to use the staff. Gabrielle even makes a comment of "I just wish you'd give me warning when it's a test day." However, as Gabrielle tells Diana, she still really is not good at hunting. The greatest test Gabrielle gets is dealing with the Princess herself. She has to hear (honest but) spoiled behavior about hair brushing, sleeping on the ground, eating cheese, and talking to the starving poor. Gabrielle handles it all with good humor. When Diana is talking to "the little people," Gabrielle prompts Diana fairly subtly and lets Diana know when to make things up. Gabrielle also shows her compassion by giving away all the food that they had to eat to the poor family. Gabrielle is growing better at her weapon skills and becoming more mature. Death takes a holiday. Sort of. Xena shows her devotion to Marcus and Gabrielle shows her devotion to Xena in MORTAL BELOVED (#16). Marcus and Xena cross into Tartarus with Charon's help. Michael Hurst is indeed under all that makeup. A girl comes in babbling about a ghost in the forest at the start of MORTAL BELOVED (#16). What does Xena do but jump up and go after it. It is Marcus, Xena's now-dead love from THE PATH NOT TAKEN (#05). He tells her that good souls need help in Hades and only manages to give her half of the instructions on getting to him. Xena takes this to mean she should swim to the bottom of the deepest lake around. When Gabrielle comments that Marcus might not have meant her to swim to the bottom and that she might die, Xena says when the man she loves asks her help in saving good souls, she has got to try. If that means dying, "then I'll get to him one way or the other." Xena did not use to pay much attention to love, except as a way to use people. Now she is not only ready to die for 'good souls,' but she is willing to leave Gabrielle for Marcus. She does not try and find out more about what is wrong or how to get there, she just splits. Love seems to be a powerful motivation for Xena once it hits her. She changes her ways because of Hercules. Now she's willing to leave everyone else behind to help Marcus. In the Elysian Fields, Xena gives a good show of her skills. She keeps anything useful that comes her way, especially the wine for fire-blowing. She turns the evil people against each other in order to escape from them. She even knows how to use Hades' pride against him to grant her Marcus' life back for 48 hours. The most interesting thing that happens there, though, is how she responds to the question how she ended up dead. She says, "I fell off my horse and broke my little neck." She refuses to grant anyone the honor of having killed her, but she also denies herself a 'warrior's death' by it. She used to be very obsessed with being a true warrior, so this seems to show she has changed her priorities. Xena also is a good teacher. She taught Marcus how to start on the path of doing good. 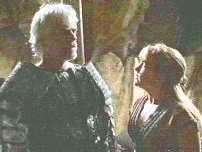 When Marcus suggests using Hade's helmet to stay mortal and be with Xena, she does not let her own wants sway him. Marcus says, "You taught me that it's not about what I want." To teach that, Xena had to have started understanding that as well. That, too, is very different from the days when everything was about the power she wanted. Another curious thing was that Xena chose to kill Marcus herself rather than simply let Hades take his life away. She might have thought that actually killing Marcus was necessary to him being judged again. Still, Marcus could have killed himself. The fact that Xena could kill someone she loved deeply shows that she still has not changed completely. Xena can still deaden her heart to death and loss to some degree. The look on her face after she killed Marcus showed that the degree of hardness was changing, though. When Xena runs after the ghost, she leaves Gabrielle behind to calm the hysterical girl. More and more, Xena does the protecting and leaves Gabrielle to do the talking and soothing when they are helping people. Still, Gabrielle can survive fairly well on her own. She camps out by the lake with no problem. When Atyminius comes, Gabrielle is afraid but grabs her staff and gives him a bloody nose before getting knocked unconscious. Later, Xena even lets her help spring the trap on Atyminius when usually Gabrielle is put somewhere safe. Also, Gabrielle shows how loyal she is to Xena. She realizes that Xena is purposely leaving her behind, perhaps for good, yet she still waits at the edge of the lake. She could have gone to a nearby town to wait, or tried traveling some on her own, but instead she patiently waits for Xena right where Xena will be coming back. Things heat up for Xena and Autolycus in more ways than one. Xena has to put up with Autolycus to repay a debt in ROYAL COUPLE OF THIEVES (#17) and Gabrielle has fun getting captured repeatedly. Is your life always like this? A soaked Warrior Princess is anything but cooled off. When Xena was young, she once was wounded in battle. Some wandering people took her in, tended to her wounds, and one even died protecting her from the enemies that followed her. Now those people have lost a chest containing something that defines who they are. They ask Xena for help, and now she is willing to go to any extremes to get the chest back for them. She is even willing to put up with Autolycus treating her like a concubine. Xena manages to hold her temper back just enough not to ruin their plans, but also manages to get some pay-back in, showing that she still does not take bad treatment from anyone. Xena also uses seduction twice as a way to distract the men from what Autolycus is doing. Xena seems to despise, or at least not use, many of the tactics that she used in her warlord days. Yet we have seen twice now, in CRADLE OF HOPE (#04) and ROYAL COUPLE OF THIEVES (#16), that she is willing to use her body in a limited way to get to her goal. It is interesting that she still thinks it is okay to use that skill. When Autolycus brings up Xena's connection to Hercules, she eventually says that she and Hercules have accepted that they will never be a couple. Xena originally was the one to leave Hercules so that she could start redeeming her past (without his help). Now we learn they both accept the fact that it is going to stay that way forever. She does not explain why they came to that conclusion, though. Is it because of Marcus, or because of Gabrielle, or do they feel like they can do the most good traveling separately? Finally, Xena has changed enough that even Autolycus, after being around her for a short while, trusts her. When the chest is opened and the light comes out, Xena tells Autolycus and Gabrielle not to run. They are both scared but trust her enough to stay by her side. If barding gets slow for Gabrielle she has a future as a thief -- she displays the ring she swiped from Autolycus. Gabrielle helps Xena catch Autolycus. First she helps with the fake gem. Then she thinks to try using Autolycus' ego against him and it works. She is beginning to learn what motivates people. Xena and Autolycus rely on Gabrielle's knowledge of Sinteres to masquerade as him. This shows Xena's trust in Gabrielle's knowledge and the fact that Gabrielle knows quite a few stories by now. She is probably picking up more as she wanders with Xena. When Gabrielle finds out that the real Sinteres is on his way to the island, she tries to get to the island herself to warn Xena. Her skill is not quite up to that, though, and she gets caught. Xena gets Gabrielle free, then sends her off to mark the trail to where the chest is being taken. Gabrielle knows how to do this, but Sinteres manages to capture her again. Gabrielle is usually the one with high morals. It is interesting to note that she does not think it wrong to steal a stolen ring from a 'thief for hire.' Only when she learns that Autolycus is not as money-hungry as she thought, then she is slightly sorry she took it. Meleager is at a loss for words and almost everything else early on in this episode. In THE PRODIGAL (#18), Gabrielle begins to understand how much she has learned from Xena and how much she loves adventure. Xena learns that family is important to Gabrielle. "This town has a hero." Xena gets her juices flowing in this early fight. We do not see much of Xena in this episode. Still, at the beginning we learn that Xena is willing (if sad) to let Gabrielle leave her. Also, we learn that Xena really does not understand the difference between talking with a close friend and talking with a sister or brother. Then again, she was never close to anyone but Lyceus and he died a long time ago. Gabrielle learns a lot about self-confidence in this episode. Gabrielle freezes during a relatively minor fight at the beginning of THE PRODIGAL (#18). She suddenly decides that she does not want to burden Xena with having to protect her, even though Xena has been doing that from the beginning of the series. Still, now that Gabrielle is used to taking some of that burden off of Xena, she is not willing to threaten Xena's life with it. Quite simply, Gabrielle is not used to freezing up/burning out and has to deal with the fact that it can happen to warriors. So Gabrielle decides to go home. She works on perfecting her hitch-hiking skills, learns that her village is in danger, and takes off to warn them. When she arrives back, not only is her news old, but she is not very happily received by the village or her sister. The village has hired a champion, Meleager, to save the village. When he arrives, Gabrielle sees her first real burn-out case. Meleager drinks to forget all the killing he has done. He hardly even respects the people who have hired him. Gabrielle does what she does best: gives a rousing speech. Since she has recently experienced a minor form of burn-out, she uses that to get Meleager back on track. She gets to show off all the warrior skills she has learned from Xena. She naturally steps in with Meleager to plan the traps, set up the strategies, and to the read tracks in the dirt. When Meleager gets captured, Gabrielle goes after him to set him free. When she gets captured, she says on purpose, she even manages to make a plan to get them free. Even when Meleager goes missing near the end, Gabrielle is able to take over and lead the village's defense. Also, Gabrielle is a good judge of character. When Meleager goes missing, she believes that he is coming back. Luckily, he does. Gabrielle is also willing to give up adventuring for her sister, Lila, or so she says. At the end, she realizes how much she has learned from Xena and how much she misses adventuring. Lila has also come to realize that and she sends Gabrielle on her way, making Gabrielle promise to visit her more often. It is not until now that Gabrielle begins to understand how much she has learned from Xena, how much she has changed and matured, and how much she enjoys traveling and helping people. "She taught me when to fight and when to talk. She taught me to know the difference between a friend and an enemy. She taught me what it's like to have a best friend."